UNITE HERE Local 25 represents 7,500 hotel and casino workers in the Washington, D.C. metropolitan area and has been fighting for justice in the hospitality industry for nearly 80 years. We are currently seeking applications for the position of Organizer-in-Training. Organizers-in-Training and Internal Organizers are responsible for recruiting, training and supervising rank-and-file leaders and further developing our current rank-and-file leadership structure. Organizers also work to increase the participation and mobilization of the union’s membership for large-scale action to organize non-union workers, fight for higher wages and better benefits, and increase the rights of hotel workers across D.C. This is an entry-level position with strong prospects for advancement. All newly hired organizers will spend several months training with experienced organizers in New York City. Resourceful and committed staff members who become familiar with the union's operations and distinguish themselves will have numerous opportunities for rewarding and interesting work. Candidates who are bilingual in Spanish and English are strongly preferred, though not required. Candidates with language skills in Vietnamese or Amharic will also be given extra consideration. Excellent benefits and retirement package. Applicants must include a résumé and cover letter. The cover letter should be clear and concise and explain the specific reasons for your interest in the position. Please also specify, with appropriate explanation, which of the listed qualifications you possess and which ones you do not possess. The cover letter, résumé, references and additional materials should be emailed to: careers@dchotelworkers.org. 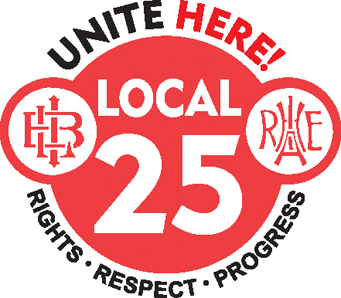 UNITE HERE Local 25 is an equal opportunity employer. All persons regardless of age, race, ethnicity, gender expression, religious affiliation or sexual orientation are encouraged to apply. People of color, women, and members of the LGTBQI community are strongly urged to apply.